Terroirist: A Daily Wine Blog » Help William Allen #EscapeGravity! William Allen of Two Shepherds needs your help. I’m a huge fan of William and his wines, so I want to help make his plea. I met William at the 2011 Wine Bloggers’ Conference and we immediately hit it off. Passion is hard to fake, a few people can match William’s fervor for wine. William was there because he kept a wine blog at the time (Simple Hedonisms), but he was really buzzing about the upcoming release of his out-of-control garagiste project, Two Shepherds. About 15 years ago, William started brewing beer in his garage. 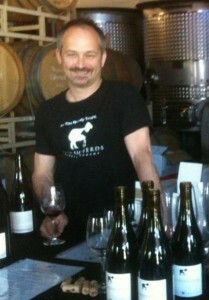 Since he was in love with wine, he decided to also try his hand at winemaking. The hobby soon became an obsession, so in the summer of 2009, he decided to take a four-month sabbatical from his tech job to move to Sonoma, plant a vineyard, help out with harvest, and network. At that point, he was hooked — and knew that he wanted to share his wine with the world. So in 2010, William sourced enough fruit to make 175 cases of wine. They turned out to be a hit. His wines have since been praised by folks like Jon Bonné, Alder Yarrow (who profiled William in 2013) Richard Jennings, and countless others. Last year, Allen bottled 1,000 cases of wine. A few months ago, William and his partner, wine industry veteran Karen Daenen, decided to kick things up a notch. With the goal of growing to a 3,000-case winery, they purchased a video-production warehouse in North Sonoma and turned it into a (almost functional) winery within just 3.5 weeks. It will eventually include a tasting room, as well. They’re calling the effort to triple in size in the next five years “#EscapeGravity.” And through Indiegogo, they’re trying to raise $25,000 to help their efforts. Since most wine stories these days seem to be about small wineries being purchased by huge wine companies, the opportunity to support a small winery taking the next leap comes along all too rarely. So please help William #EscapeGravity!